Our own original design crust (do not be fooled by imitations or copy-cats). 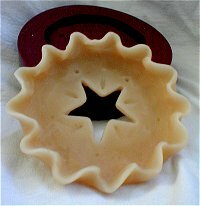 3" pie crust, fits 3" pie tins. Mold color may vary from that shown. Pie tins for the crusts can be purchased in our PIE TINS section.